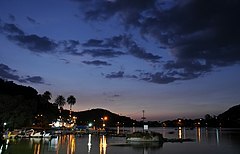 Nakki Lake is a lake situated in the Indian hill station of Mount Abu in Aravalli range. It is a very ancient sacred Lake, according to the Hindu legend. It is called by this name because it was dug out from Nails (Nakh). One story is of dug by Gods to live in, for protection against the Bashkali rakshash (a wicked demon). While other is of Rakshiya Balam (a sculpture of Dilwara Jain temple), who dug the lake, as the King told that whoever will dug the lake within one night, he will marry my daughter to him. But later Queen refused and he couldn't marry the Princess. Temple of Rasiya Balam and Kunwari Kanya (princess)'s is located behind the Dilwara Jain temple. The lake is in length of about a half mile and in width about of a quarter of mile and 20 to 30 ft. deep towards the dam on the west. It is an important tourist attraction of Mount Abu. There is the Toad Rock on a hill near the lake. Toad rock is so called as it looks like a toad about to jump into the lake, from the side of the rock facing the lake. There are two ways to go up and down the rock; to climb the rocky hill side or to use the steps leading down to Nakki Lake. By the side of the lake there is a path leading to Sunset Point. It is forbidden to climb to Sunset Point due to dangerous bandits living around the path to Sunset Point. Raghunath Temple and Maharaja Jaipur Palace are also on hills near the Lake. Boating in the lake and horse rides around the lake are available. Mahatma Gandhi's ashes were immersed in this Holy Lake on 12 February 1948 and Gandhi Ghat was constructed. Toad rock and the Maharaja's palace can be seen in the background of the Nakki Lake. Nakki Lake fountains in the evening. ^ Nakki Lake. Retrieved 2 January 2013. Wikisource has the text of the 1911 Encyclopædia Britannica article Abu. This page was last edited on 23 March 2019, at 13:06 (UTC).